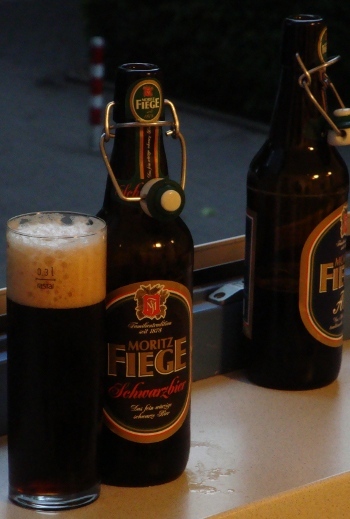 I have three beers from the Privatebrauerei Moritz Fiege, located in Bochum, a city between here and Düsseldorf. The first is an alt, and as Bochum is so close to Düsseldorf, I feel it’s fair to count that as the first entry for the style in our little kölsch-alt battle. After that I have a schwarzbier and a pilsner to try. Each of the Moritz Fiege beers has a pithy description beneath the name. The Moritz Fiege Alt says “the traditionally brewed altbier”. The alt pours with a thick, creamy beige head atop a beer that is either a dark honey color or a light caramel. The aroma is strong and also could be caramel, but there is a rich character of dried green herb and winter spice to it as well. There is the lightest hint of sulfur and a bit of alcohol noticeable. There is a strong earthy hop flavor grounding the alt. This can get a little overbearing, as the toasty and sweet malt flavors are a bit weak. The hops and the alcohol combine to make something of a strange bitterness. It is a bit watery as well. If it were a bit sweeter all the problems would be solved. Next up, the Moritz Fiege Schwarzbier, “the fine and spicy black beer”. To style, this beer is nearly completely opaque. This one reminds me of the monolith from 2001. There is a fair amount of coffee-tinted head, which isn’t lasting, yet forms a lacing on the glass. There is hardly any aroma at all. The malt and yeast make some sort of chestnut character and the hops and perhaps the color produce the sensation of being in the woods. The flavor of the schwarzbier is also very clean. There are some noble hop flavors and a bitterness from the hops as well as the dark malt. There is almost no malt flavor. The palate is so light and fresh it is almost sprightly, with an active carbonation that keeps the bitterness in check, making it relatively easy to drink. 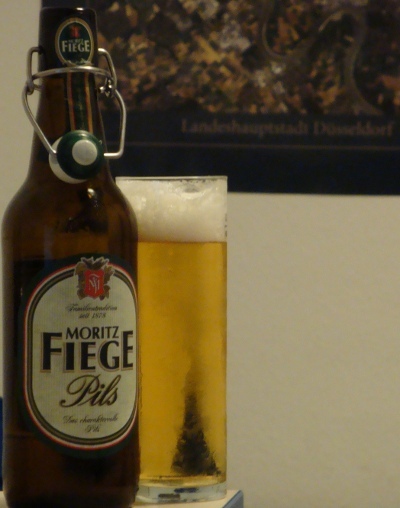 Last but not least, the Moritz Fiege Pils, “the characterful pils”. A bright straw, brilliantly clear, with a lasting creamy white head. The nose is mostly spicy hops, a mixture of pine and exotic spices. There is some pale malt aroma but not much. The flavor of the pils is fresher still than the schwarzbier, probably by virtue of the absence of dark malts. A rich, spicy, earthy and herbal hop flavor and significant hop bitterness is balanced by a slight sweetness and a palate fullness. The hops linger a little bit on the tongue, but in a pleasant way.